What are Ground Handling Wings? Ground handling wings can be anything from an old paraglider that is no longer airworthy or specifically built mini wings which is what we are talking about here. Ground handling is, although sometimes hard to master, something that must be practised. 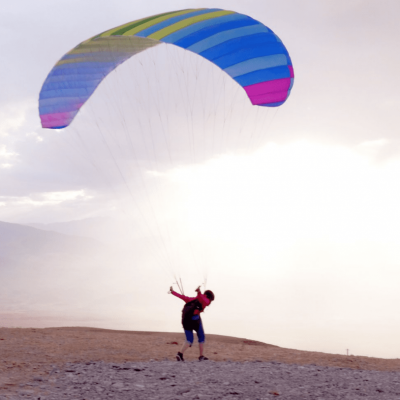 Ground handling is a skill that all paraglider and paramotor pilots need to be good at. It goes without saying that good ground handling skills are going to make your launches easy and fun but many don’t realise the added benefits of learning to fly your glider whilst it is still on the ground. Ground handling wings are designed to be as much like a full size paraglider as is possible but in a much smaller package. This will help you to practice your ground skills when it is too windy to actually fly, although its low weight still allows you to sharpen your skills when the winds are also light. 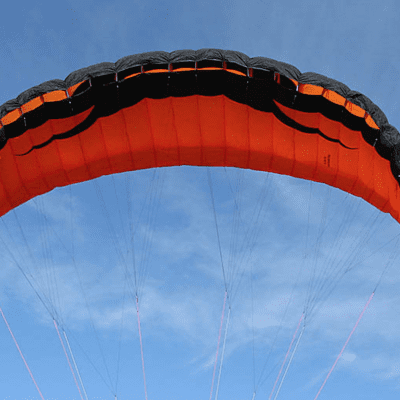 These ground handling wings mimic a full-size paraglider apart from the power produced when controlled in windy conditions, making them the ideal paragliding training tool. Why do the schools use them? A lot of professional schools agree that one hour of ground flying relates to approximately ten hours of actually being in the air. Active flying, deflation recovery and even stalls can safely be mastered. It teaches you how to fly the glider and build automatic reactions on the ground. What you are trying to do is to build muscle memory so when things go a little wrong, you will react without even having to think about it. A high level of active flying can be learnt without the dangers of being in the air on a very rough day. These purpose built mini ground handling wings are used by almost all schools who have found that they help to produce excellent pilots. There is a huge difference in the skill levels of students who have put in time with these ground handling wings and those who haven’t. Why not just buy a cheap speed wing and use that? Because speed wings have not been designed to closely replicate the reactions and movements of a full size paraglider. They really are quite different and usually have much faster reactions and shorter brake inputs. They really are not the same at all. Because of the shorter line lengths of the speed wings, they react completely differently and produce much less power; in some respects making them a little too easy. Purpose built ground trainers have been designed to address this specific issue.